20 years ago, the company created a new market segment with its pioneering and ingenious RAV4. Fundamentally different to a traditional 4x4, the RAV4 featured a small, 2.0 litre engine mounted transversally within a monocoque bodyshell, and all-round independent suspension in a very compact body (just 3.69 m long), all this packaged in an aspirational and progressive design. Launched in Japan in 1997 and in Europe in 2000, the Prius was the world’s first mass-produced full hybrid vehicle. It featured a unique Toyota Hybrid System which established a major industry milestone in vehicle powertrain development and set new standards for quiet, ecologically-res­ponsible driving pleasure. 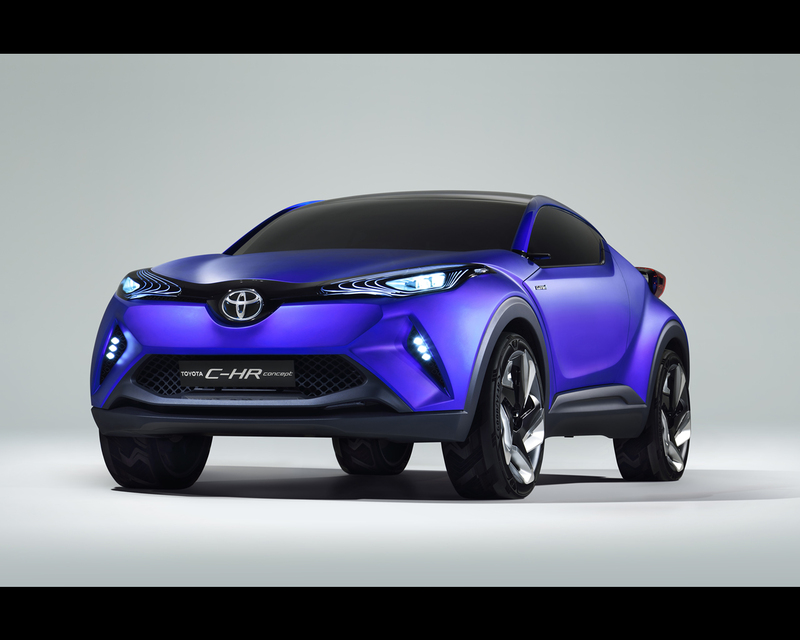 Today, the synthesis of 20 years of Toyota creativity, the C-HR Concept recaptures the design and packaging ingenuity that spawned the first RAV4, introduces a new version of the sophisticated, full hybrid powertrain technology first realised in the Prius and, inspired by the GT86, targets new levels of dynamism and agility. 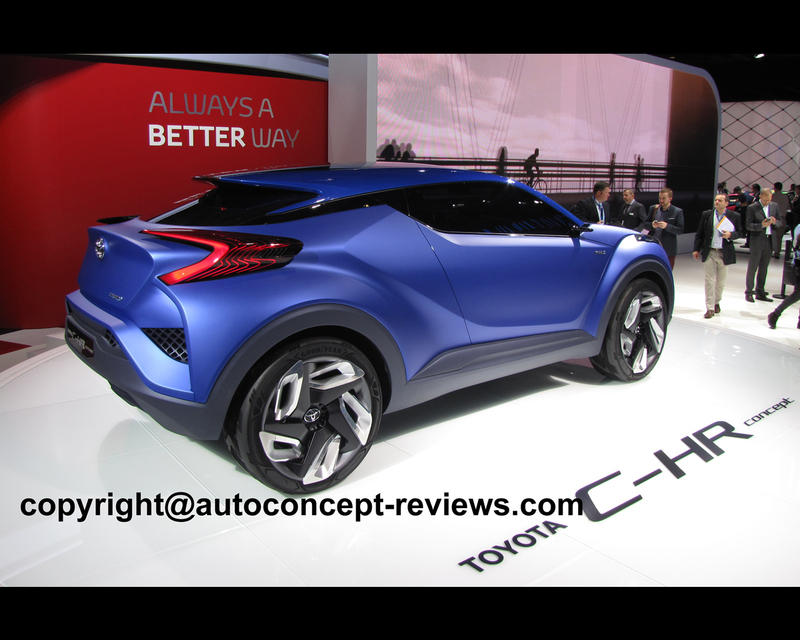 The Toyota C-HR Concept offers the combination of compact packaging and agility essential to those with active urban lifestyles. It has been conceived around a new platform designed to satisfy customers’ demands for state of the art handling and controllability. In conjunction, a new advanced full hybrid powertrain offers a driving experience matched to 21st century traffic conditions. 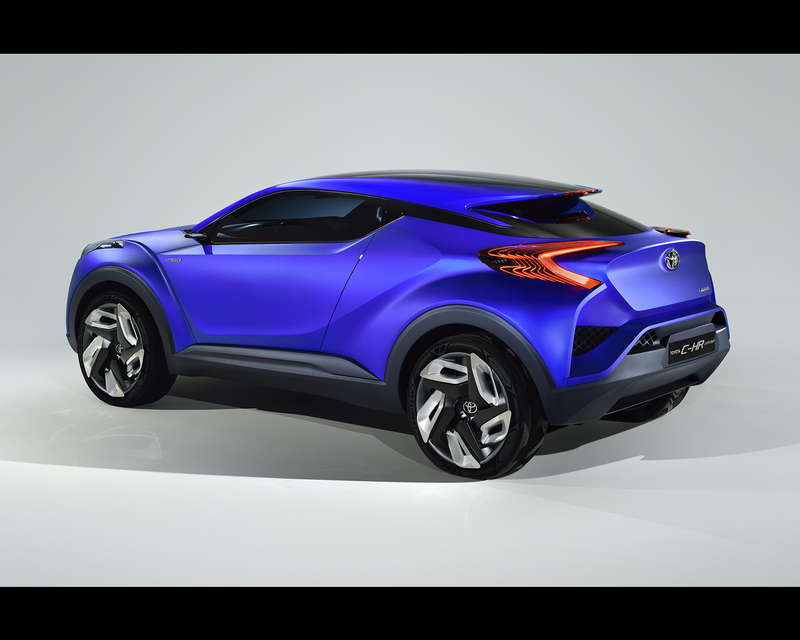 The Toyota C-HR Concept introduces an expressive new, diamond architecture styling theme to the segment. Below a compact, sensual cabin profile, the lower bodywork has been sculpted to represent the facetted surfaces of a highly-durable, precision-cut gemstone. In plan form, the corners of the bodyshell have been cleanly shaved off. This both removes mass from the overall volume, and emphasises the powerful flair of the front and rear wheel arches, reinforcing the new crossover’s broad, planted stance from every viewpoint. 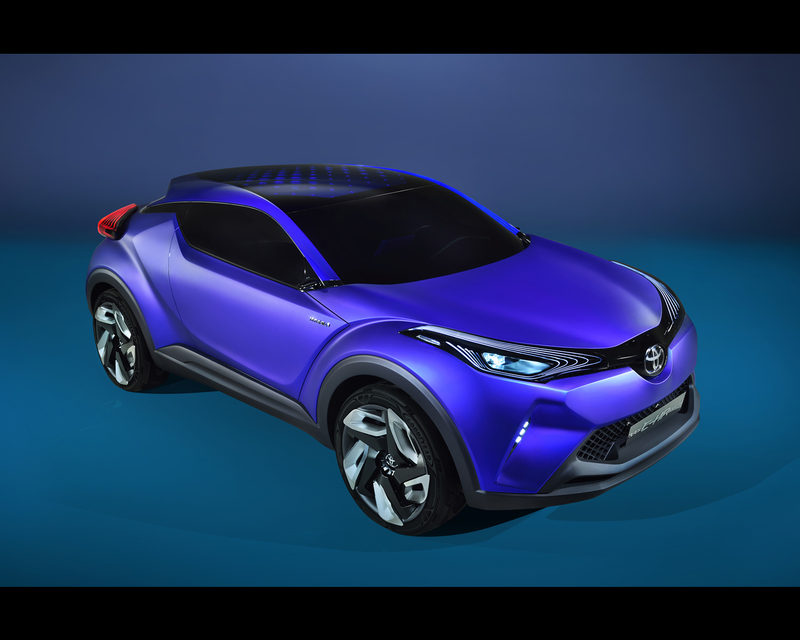 The front of the C-HR Concept not only represents a further development of Toyota’s Under Priority and Keen Look design identity, but also introduces new styling themes which hint at a future design direction for Toyota vehicles. Above a robust central bumper profile, the slim upper grille associated with Under Priority design has been evolved into a floating ‘wing’ graphic which flows seamlessly around the front corners of the vehicle to the front fender apexes. Within the wing, vigorous headlamp detailing incorporates a high-tech, 3D treatment of the distinctive Daytime Running Lights (DRL). Adding emphasis to the vehicle corners to further reinforce the new crossover’s solid stance, the large lower grille is flanked by strongly sculpted downward projections. These powerful frontal elements are underscored by an aero-inspired, floating front spoiler. The evolution of the Keen Look design is expressed through the Under Priority design with enhanced 3-dimensional structure and headlamps, making the whole front centre of gravity low whilst reinforcing it’s good stance. From the side, the highly-facetted lower body, muscular wheel arches and aggressively angular rear shoulder are juxtaposed with an exceptionally sleek cabin profile. The glasshouse is emphasized by the sweeping, uninterrupted extension of the side glazing into the rear screen. This creates a slim, floating, spoiler-tipped roofline the length of which is exaggerated by residual C-pillars which taper into needle points either side of the rear screen. 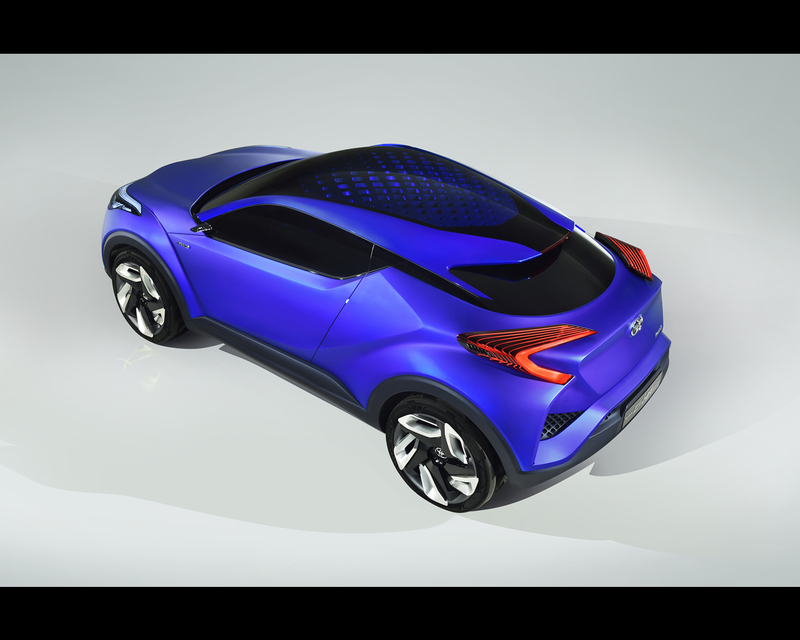 The floating roof is detailed with patterned openings which create a uniquely animated play of light within the C-HR Concept’s cabin space. Seen from the rear, the dramatically tapering glasshouse emphasises the cross-over’s wide shoulders and planted stance. Once again shaped in the manner of a facetted gemstone, the vehicle rear shares the front bodywork’s corner detailing. 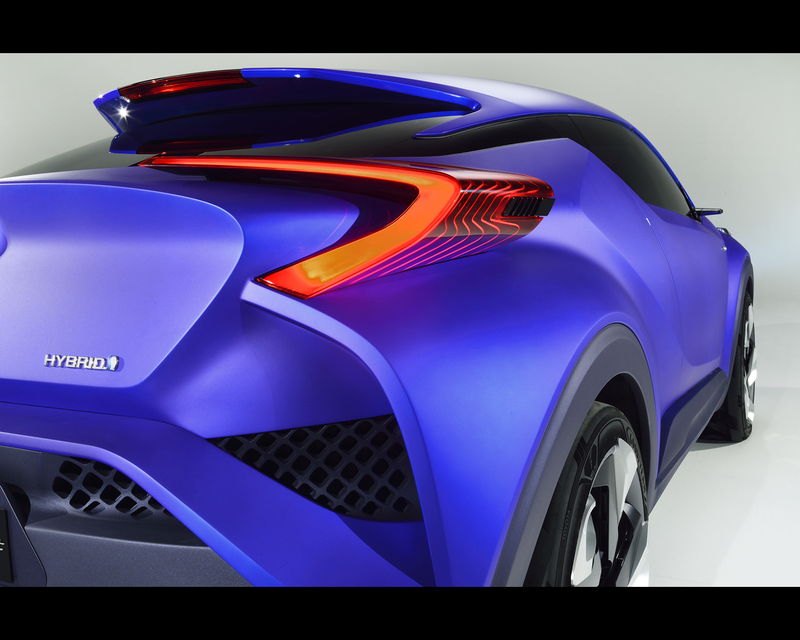 Highly-distinctive, aero-inspired, floating rear lamp clusters further enhance the broad shoulders of the C-HR Concept’s muscular lower bodywork. 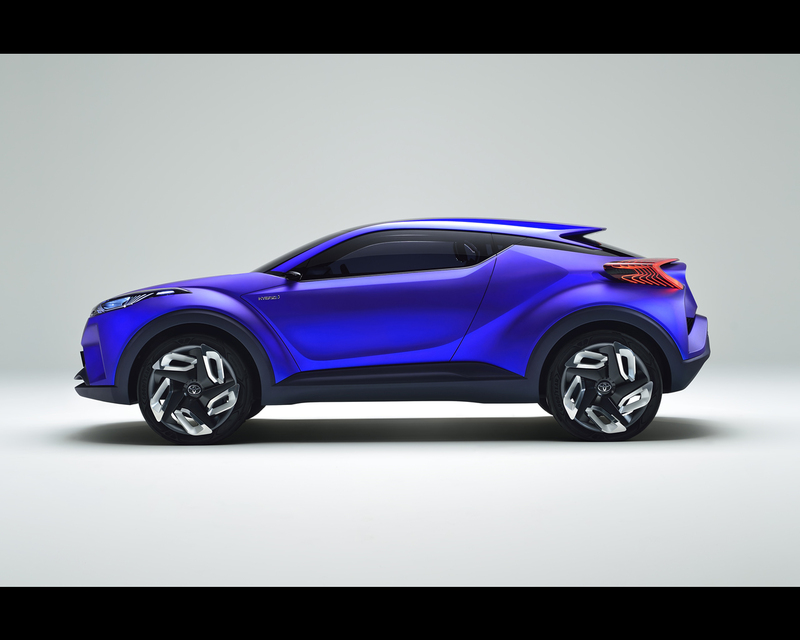 A unique wheel design reinforces the vehicle’s crossover credentials, the blade design of the spokes hinting at the sophistication and efficiency of the C-HR Concept’s full hybrid powertrain. 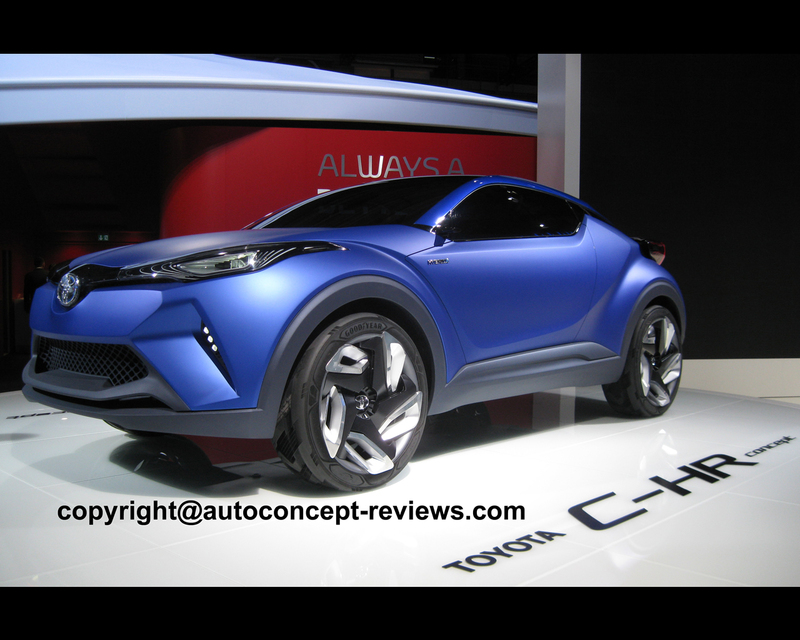 The C-HR Concept is another tangible application of Toyota’s new Global Vision thinking, first advocated by President Akio Toyoda in 2011. Recognizing that Europe is the most demanding market for small and mid-sized vehicles, Toyota uses this region as benchmark for defining future global A-, B- and C-segment cars. Toyota Motor Europe (TME) has also become the company’s skill centre for diesel engines, perceived quality and vehicle dynamics. In the case of C-HR Concept, there was close cooperation between Toyota’s vehicle planning centres in Japan and in Europe, in order to get a good understanding of the latest European customer demands and vehicle trends. As for the styling of the concept car, it is the result of a global cooperation between ED2 (European Design Development Centre) and the other design centers. TME will continue to work hand in hand with TMC (Toyota Motor Corporation in Japan) to enter the C-crossover segment. Offering excellent fuel and emissions efficiency without sacrificing either cabin space or driving ease and comfort, hybrid vehicles (HVs) are now widely accepted by consumers as mainstream vehicles. This enables them to play an important part in the commercialisation of eco-cars. Reflecting this widespread acceptance, cumulative global sales of Toyota and Lexus HVs since the launch of the first Prius in Japan in 1997 have now topped the 7 million mark. In Europe, driven by the success of Yaris Hybrid and Auris Hybrid, Toyota and Lexus have together sold some 780,000 HVs since the Prius went on sale in 2000, equating to more than 10% of total hybrid sales worldwide. On the eight first months of 2014, Toyota and Lexus Hybrid sales reached 107,000 representing 28% of the TOYOTA group sales in Western Europe. On the same period and for the same 31 countries (EU28, Switzerland, Norway and Iceland) the Yaris Hybrid share is established at 31% and the hybrid versions represent more than 50% of the Auris and Auris Touring Sports sales. 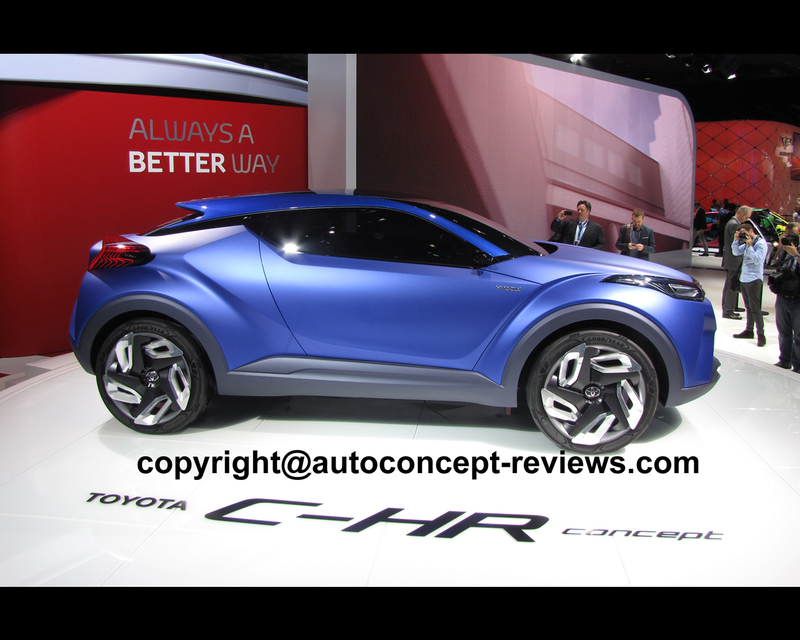 4,350 mm long, 1,850 mm wide 1,500 mm high and with a wheelbase of 2,640 mm, the C-HR Concept is conceived around a new platform. With a lower centre of gravity and increased structural rigidity, it will contribute to greatly improved driving dynamics. The concept employs a new, full hybrid powertrain that will deliver significantly improved fuel efficiency.